Managing a fleet of Mac devices and users is becoming more common today. In the late 1990s and early 2000s, Microsoft Windows was the dominant platform for organizations. While Microsoft is still incredibly popular, Apple has made tremendous inroads into the commercial sector. More organizations than ever have some Apple Macs in their IT environment, and some of them are exclusively Mac. Once most popular in the education and design sectors, today’s Apple Mac organizations include a vast array of industries. All sectors are now leveraging Macs in some way, not to mention iPhones and iPads. IT organizations are challenged with managing those Mac users. While one solution could be to manage Mac users through Apple Open Directory, there are also other platforms, such as Directory-as-a-Service that may make sense. Similar to Microsoft’s introduction of Active Directory in the late 1990s, Apple introduced their own directory services solution called Apple Open Directory. The software application was based on the open source OpenLDAP as well as Kerberos. Open Directory was distributed with Apple OS X Server. The software, of course, was focused on making it much easier to leverage Macs within an organization. It’s similar to how AD was focused on Windows. Open Directory is an on-prem piece of software, but Apple has discontinued the hardware associated with OS X Server, making it more difficult to leverage Open Directory. There is also the question of whether Apple will continue to promote OS X Server as they have in the past. 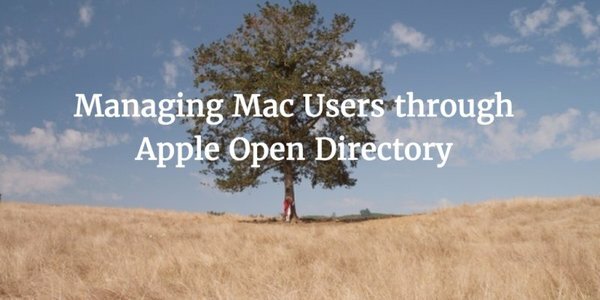 While Open Directory is a path that IT admins can follow to manage their Mac users, there are some good alternatives. One such alternative is a cloud-based directory service called Directory-as-a-Service. The virtual identity provider is delivered from the cloud as a SaaS-based service. That means that IT admins can skip the installation, configuration, and maintenance of the directory services hardware and software. Also, the cloud directory service connects to a wide variety of platforms and applications regardless of their location or protocol. In fact, the goal of a Directory-as-a-Service platform is True Single Sign-On™ where systems (Windows, Mac, and Linux), applications (web-based and on-prem), and WiFi networks can all be accessed via one set of credentials. This provides a powerful way for IT admins to securely control user management while end users get SSO for the IT resources they need. A core part of the hosted directory is integration with the Apple Mac platform where users and the device itself can be managed. If you would like to learn more about how IT organizations can manage Macs with Open Directory or Directory-as-a-Service, drop us a note. We’d be happy to help. Or, feel free to sign-up for a free account and start managing your Mac users and devices. Your first 10 users are free forever.